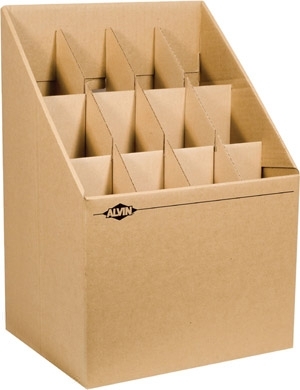 The Alvin Blueprint Upright Vertical Roll Storage File is available in two styles. One model has 12 compartments (cubbie holes) for rolled drawings and the other model has 20 smaller compartments (cubbie holes) for rolled drawings. The Alvin Blueprint Upright Roll File is designed to hold your drawings, maps, or posters in a rolled upright fashion which allows you to quickly and easily identify which roll you want access to. Not pretty but does the job! Was thinking why cardboard? but then I realized I was just storing drawings and this fit the bill. We bought one for each employee in our Architectural department and they have worked without issue. Decent quality and would buy again. -Roger S, Camden NH.